Lutterloh was started in Germany, 1935, and is still going strong today. It’s similar-ish contemporaries were a French system called Eclair Coupe Paris and The Haslam system which I think was American. This is a YouTube video of the Man From Lutterloh demonstrating with a simple waistcoat how it all works (14 minutes long if you have the patience). So how did my try at Lutterloh go? Well, drawing the pattern out was dead easy like the advertising says. But…and this is a big, HUGE ‘but’ : there are no seam allowances included on the patterns, no real indication of grain placement, and no facings or lining pieces. Also there are absolutely no sewing instructions or finishing suggestions, no hints of what to interface, line or even where to put openings to get the garment on and off. So, basically, if you don’t know how to work out all of that or really don’t relish the challenge of learning and experimenting I wouldn’t recommend rushing off to try it out. There are some lovely styles from the French system sold singly on Etsy by Mrs.Depew Vintage which could be an inexpensive way to experiment if you are so inclined. Someone else on eBay in the USA sells whole collections of vintage Eclair-Coupe Paris on Cds at a (in my opinion) very reasonable price. If it does appeal I recommend you consider arming yourself with a good sewing and perhaps a fitting book as well. How accurate was the pattern once drawn out? Actually not too bad at all. The sleeves needed no alterations other than shortening to suit me and the skirt just a little adjusting to hang well. I did add a good amount more fullness into it than the pattern had though. The bodice needed the most alteration as the shoulder height and pitch were really wrong on me, the armhole needed moving in an inch and the vertical under-bust dart was in a bad place so I finally just took one of my own basic bodice blocks and made a similar pattern with it, knowing then that all elements would fit me. I’m not at all sure if the bodice problems were due to me being a bit careless with how I marked my initial pattern points or what. I’ll have a better idea when I tackle a second style. I made a muslin mock up first which as well as highlighting fit issues was a huge help in deciding how to finish edges and where to locate the zip. I opted for one in the left side seam instead of a centre back one, and made the left side under-wrap pass through a slot formed by leaving a part of the right dart open…rather than the usual side seam opening, which I thought was kinda clever pat on back. The neck edges are finished with a narrow self bias binding. The three extended sleeve darts definitely needed some support so some very stiff Vilene cut in crescents shapes then sewed into the armholes did the trick. The belt ends are just closed in the back with hooks and bars. I’ve read on the internet that while Lutterloh Co. is still a very active company in producing contemporary styles they aren’t interested in reproducing the vintage books. I also have gleaned that the company is fairly hot on copy write infringements- it seems ok for people to post pictures of the styles but absolutely not of the actual patterns. Google ‘Lutterloh patterns’ for all kinds of further info. Anyway it’s an interesting pattern system, a fab way to access unusual vintage patterns from 1935 onwards and like I said (while gazing at my badly organised shoeboxes bursting with vintage pattern envelopes) until you draw them out on paper they take up virtually no space! Ah, and what about the fab chunky platform shoes I’m sporting in the pics you ask? Frank Lutterloh, the current head of the company has just started a Lutterloh blog as of Sept. 2013 featuring both contemporary and vintage clothing made with the Lutterloh system. Should be interesting. Hi Jenna, it is easy enough but definitely start with something simple so you don’t just get discouraged from the starting gate… like a skirt or easy blouse. And be prepared to make muslins to check fit and work out how best to sew the garment up. I think for all but fairly experienced sewers the lack of sewing instructions can be the biggest stumbling block but if you already know the basic order most things need to be assembled in, and are happy to draft your own facings and linings it’s just diving in and getting the hang of it. Since making that first dress mainly I’ve ended up looking at the mini patterns more as a reference to the shape of pieces while drafting from my own blocks or making alterations to vintage tissue patterns that are already close in style. Just give it a go and see what you think! Hi! How did you alter the Lutterloh picture? If one puts a zipper on the left side of the dress, how do you get into the dress? I wanted to put a left side zipper on a boat neck dress. Thank you, Kathy G.
The dress pulls on over my head. Having both the side opening and the release from the wrap being untied there is a good amount of room to do this. For a boat neck dress with a side opening you just need to make sure the boat neck is large enough for you to get your head through. On average 23 inches is just enough though to not mess up hair/makeup a few more inches makes it easier. you could make a small bound or faced slash opening at the centre back neck if you need a few inches more to get the opening over your head and hair comfortably. A lapped zipper sounds nice. Bear in mind though if your fabric is a bit thick a centred zipper may lay better… sometimes the wider lap can make that side look a bit lumpy when your dress is worn. For vintage styles I always do either lapped or centred depending on the fabric, generally hand picked too as it’s a nice touch (and can be taken out more easily if needed). I avoid invisible zippers like the plague! Thanks Geraldine but no, I’m not reproducing or selling them. Apparently German Ebay is a good place to look for original ones. I’ve also managed to get a couple of original books on French Ebay. The Lutterloh company, as it is still in existence and making new patterns, forbids people making copies of their vintage pattern books to sell and they are still under copy write. 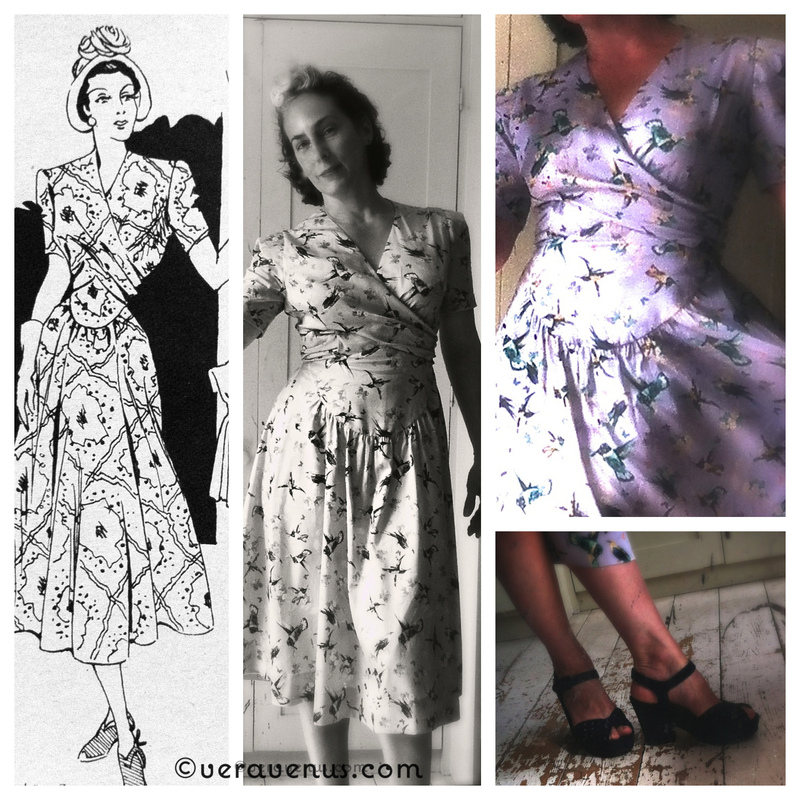 Many people wish they would re-issue their vintage patterns, perhaps if enough people ask sometime they will! Don’t be scared, it’s fun though being able to sew without any instructions is important. I love your dress, worth all the adjustments you had to make and you look gorgeous in it. I am new to the Lutterloh System, have recently bought the latest one. 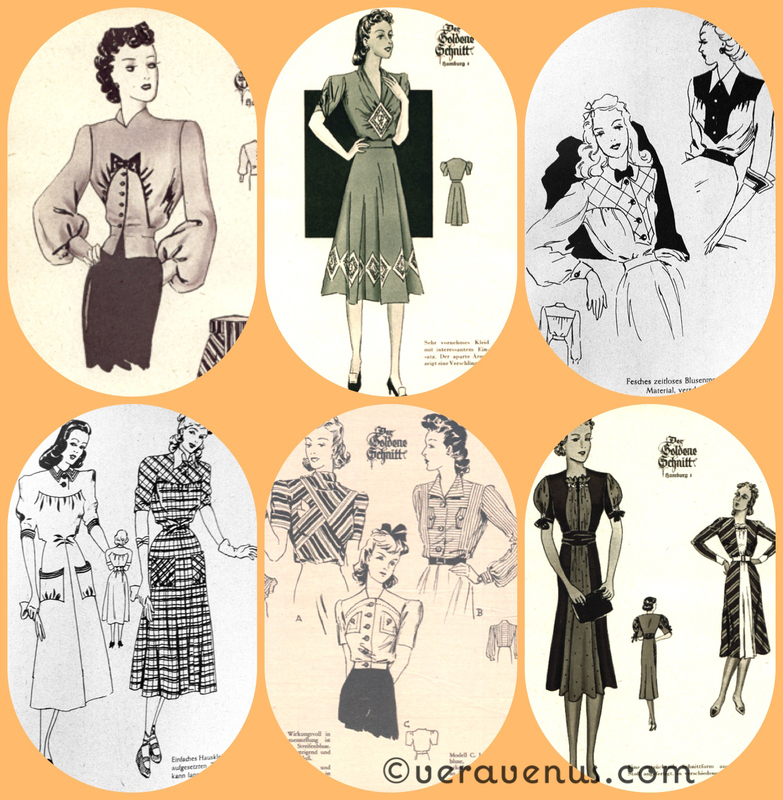 Now I am researching the vintage patterns and loving the range available but not the prices!! I had no idea there were digital copies of the books, the search goes on. Thank you Chris! Have a look on ebay for Eclair Coupe Paris . There is a US seller with vintage ones on cds at a much more reasonable price than vintage Lutterloh can be found for. Its a different set of rulers and also has no making up instructions but a similar sort of home drafting system. Very chic styles. All the diy pattern methods from ‘back then’ are so interesting aren’t they? In a way I think those systems had more to offer the home sewer in terms of variety of styles and as a tidy delivery system too. I spent the other weekend researching scale-upable patterns. The general consensus concerning fit seems to be that (and as most modern patterns still are) the small scale pattern drawn up best fit figures with certain height/weight proportions. But perhaps over all the home seamstress of yesteryear was more prepared to and experienced in fitting herself. Lol, just things I’ve been thinking about recently! But do take the Lutterloh plunge, it is quite fun and bound to stretch your skills in a good way. Beautiful dress! Love the style and fabric. I just purchased my first set of 1940’s patterns in Haslam. I have been sewing for 44 years and can make patterns, grade, etc but never attempted making patterns from miniature pictures. Hopefully it will go as smooth as this dress that you made 🙂 I truly enjoy your site and free patterns. Thank you Nancy! I have had a 40’s Haslam coat pattern on my table for a few weeks but not started work on it yet, your comment has reminded me 🙂 It will be mooth sailing for both of us then I hope! Ohhh Vera! Hi! That 1949 dress came out absolutely beautiful! There is nothing wrong with your waist! It’s just that you have a normal waist while the model’s drawing has a very tiny waist. Plus I think people from the 1930’s – 1940’s were still pretty petite in stature– especially the women. I have those patterns too and now that I have seen you make it I may give it a try. I’m having terrible fitting issues with Lutterloh due to my shape. I am shaped like a rectangle or a column with little to zero waist definition. Also I am plus sized so that adds to my being out of the Golden rule in sizing. Sigh. I will keep working on the basic blouse so that I can make a better sloper. Thank you for all your inspiration! Now I know the sequence for me, I can use it for all the Lutterloh patterns…… It also means I don’t need to do most of the adjustments I have to make on presized patterns except for a (much) smaller full bust adj and a bodice length reduction. Got to love that! Dear Jan, It sounds like you have a good method in place. My weight has changed so much that now I don’t know where I’m at. I’ll just keep trying as time permits. Thank you. A wonderful dress and I love you as a Lutterloh lady too! It seems strange that in the current climate of all things retro and vintage fashion that Lutterloh are not enthusiastic about releasing some of their older patterns.You would have thought that they would have wanted to cash in on it. Well done on the recovery of your foot by the way!! Your dress is fab! I always wondered what that Lutterloh palaver was all about. Trust the Germans to come up with a such a savvy little system. As my husband and I often remark while cruising around town in our Audi – how ever did they lose the war? I think this is such a great blog. A very talented lady! Dress is gorgeous so into tea dresses at the mo. Glad u had a look at this system I’ve been mulling over doing something with it but wasn’t sure where to begin. I will definitely give it a go keeping in mind ur points. As always great shoes. Thanks and I hope you do give it a go; it’s quite interesting, especially for pattern geeks. Would like to hear how you find it! Wow. 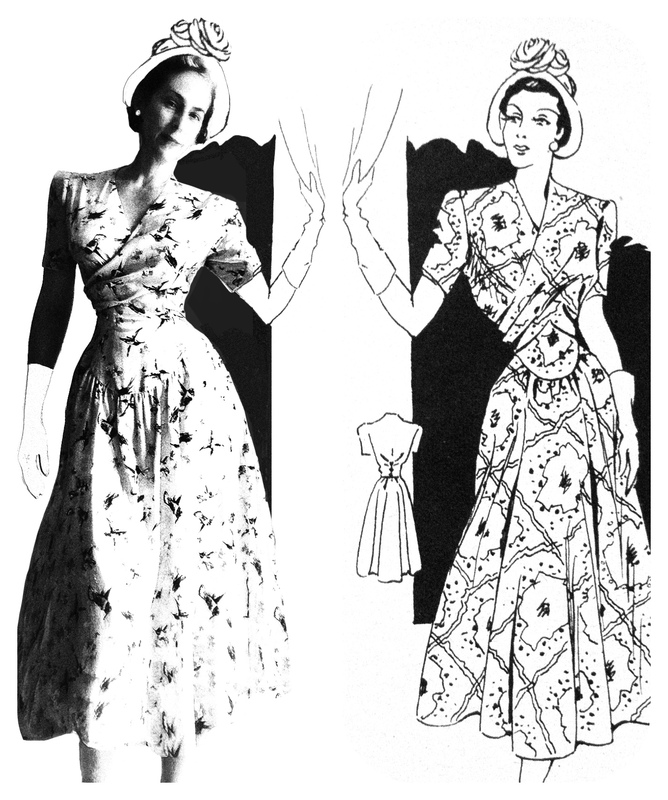 I can do the 1940’s patterns with just the little dots, but no grainline indication? Wow, those ladies knew how to do it, as do you. I don’t think I’m ready for the Lutterloh! But, I love the print and the new shoes! The dress is beautiful! I love the fabric! I was running in my house to answer the door and wearing some very wide trousers- one foot got trapped in fabric and I went down like a chopped tree. It was a nasty break but almost as good as new now . For a shoe fan like me its been hard! Yes, I think using Lutterloh more as a guide is a good way to do it… it doesn’t take much to throw an entire pattern out and make it a little wrong everywhere especially if one isn’t used to how a pattern piece ought to look. Still, interesting to try it. I’m partial to the bodice on that dress with the diamonds. I probably wouldn’t do the diamonds around the hem, but the bodice is exquisite! I know what you mean about the hem diamonds, if the skirt length isn’t just right they could certainly look too heavy. I rather like them though and would probably add them.. but maybe smaller ones than illustrated. Yay! Another Lutterloh sewist! I have the 1941 book too! I also have 1938 and 1954. 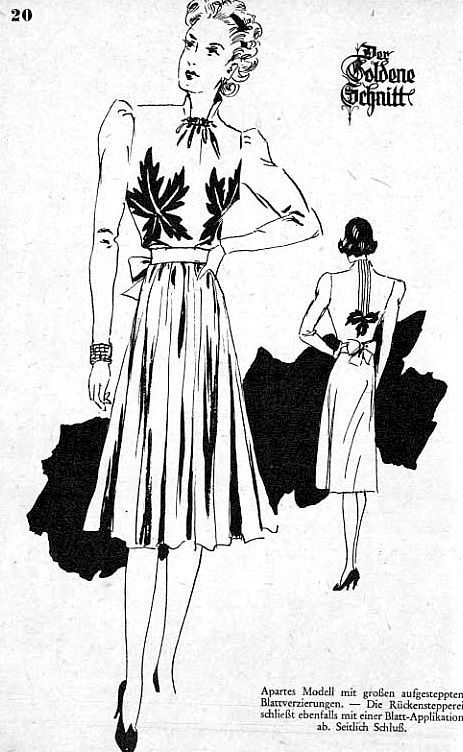 I’m planning to make dress 121 from 1941 this summer. I made a few garments from the lutterloh books and I had huge problems with resizing the patterns. I now use my block patterns and draft my own inspired on the Lutterloh illustrations. And I use the miniature patterns as a guide. (P.s. I recently nominated you for a Liebster Award). Ooh, 121 is really pretty! I think I will probably end up doing as you do and use my own blocks too… I know it will save some fitting, faffing and fuming time that way.